After dinner with some friends at a Chinese restaurant lastweek (yes, it is very easy to eat at a Chinese restaurant without consumingeither pork or shellfish), one of them, Bruce, opened his cookie and received afortune which said, “Let reality be reality.” He didn’t know what to make ofit, and asked me to write a blog post explaining it. My first thought was of the book, “Reality Isn’t What itUsed to Be,” which I don’t recommend. It did, however, have some interestingpoints about how reality is a social construct, and therefore is subject tochange over time. For instance, the reality these days is that if you pull thecord on a public bus, the bus will stop at the next bus stop. There is no lawor mechanical necessity that causes this to happen. It’s just an unspokenagreement between the riders and the driver that this is how it’s supposed towork, and it does. There is a certain wisdom and comfort in allowing reality tobe what it is. There are people who waste untold time and energy lamentingthings from the past. They can’t seem to get over a broken relationship, or thefact that they were born into certain circumstances, or any number of otherthings that they can’t change. For them, “Let reality be reality” might be good advice. Accept what is, and move on with your life. On the other hand, our present-day reality includes manythings we shouldn’t just accept. People starving to death. Animals being huntedto extinction. Water and air being polluted. These are things we ought to change.These are examples of circumstances in which we can do something, and shouldnot just allow the past or current reality to continue as the reality of thefuture. The Serenity Prayer is pretty good advice, but according to Jewish tradition, it doesn’t go far enough. It implies that if there is something that I, personally, do not have the power to change alone or in my lifetime, I should just leave it be. In the section of the Talmud called “Pirkei Avot,” (“The Ethics of Our Fathers,”) the rabbis acknowledgethat the task is great and the day is short. There is too much for us to doalone, and, even with the help of others, there is more that needs to bechanged than can be accomplished in one human lifetime, no matter how young orenergetic a person may be. However, say the rabbis, in that case we are still commandednot to just “Let reality be reality.” Rather, they tell us, “It is not yourresponsibility to complete the task, but neither are you free to desist fromit.” We are all responsible to do what part we can, be it large or small, eventhough we may not live to see the result. So, Bruce, what I will say to you is your fortune wastelling you to accept things as they are. For things that cannot be changed atall, by anyone, no matter the effort, that may be good advice. But foreverything else, our tradition says to keep doing what you’re doing, and to continuein your efforts to make the world a better place. Personally, I’ll take theadvice of the Talmud over the advice of a fortune cookie any day. 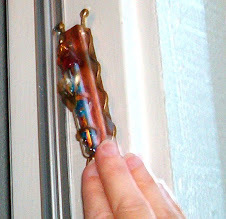 Thank you for reading To Kiss a Mezuzah, my blog about experiences I encounter while living a Jewish life in the US. I hope you will find what I write to be meaningful, and that you will pass on links to my blog to others who you think may enjoy reading what I write. Please note that I retain the copyright to all material on my blog. Enjoy, and please comment. I love to read what you have to say!